So I love the fitness community that I’ve fallen into out here in Cali. There are so many people to learn from. There are so many people out here experimenting and trying new things. And some of those new experiments are amazing…while others…well…not so much. But the point isn’t whether or not their experiments are always right. The point is that they are experimenting! And many of these experiments aren’t ground-breaking. 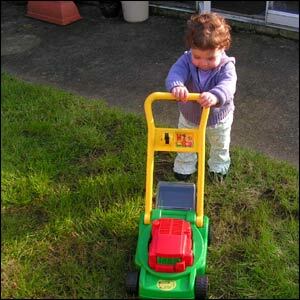 Many are with simple tools that have cycled in and out of the industry over the years. Many of these experiments are simply a new SPIN on things. Because let’s face it…there really aren’t that many NEW ideas – ideas that NO ONE ELSE out there have ever had before. BUT there are a lot of different new takes on the same old ideas – there are a lot of people out there putting a new SPIN on things. Because that new SPIN is what makes all the difference. That SPIN is what creates the perfect diet/exercise/healthy lifestyle FOR YOU! But it isn’t simply a question of arriving at your own spin. There are clear steps you need to take to turn something someone else does into something perfect for you. Learn about a diet and exercise program that you think may be good for you. Research that program that made your friend super fit. Find out how they did it. Find out all the details. Read about other people’s experiences. LEARN ABOUT IT. Then you must DO the diet/exercise/lifestyle program. And when I say DO I mean do it EXACTLY the way it was laid out. If you want to know if something will work, you have to actually give it a chance to prove if it can work. And the only way a program can prove it works is if you actually do it the way it was laid out. You can’t do a Primal diet and then eat pasta every day and then three weeks in claim it doesn’t work. I’m all for making your own adaptations to things, BUT only after you’ve done an experiment following the rules exactly as they were laid out by the people who created, and achieved success!, by following the program. If you DO a program the exact way it was laid out, you will find out if it is something that will bring you success. You will find out if it is something you enjoy. If it is something you could commit to on a long-term basis. After you’ve done the program, you’ve got to decide. Will you accept or reject the program? What parts did you like? What parts didn’t you like? After any experiment, after trying any program, you’ve got to ask yourself these questions. You’ve got to DECIDE for yourself whether or not the program was a success. You can’t listen to your friend tell you how great the program was. You can’t be swayed by all of the positive reviews. You can’t let Dr. Oz or Jillian Michaels or any of those famous people tell you what program is right for you. After you’ve, RESEARCHED and TRIED something, you’ve got to make an educated decision based on your experience. Are you going to stick with the program? And if you are going to keep doing it, then how are you going to make it perfect for you? So now that you’ve learned, done and decided, what’s YOUR SPIN? No one else can tell you exactly what will work for you. Others can guide you and make recommendations, but sorry…you should know yourself best. And the more you experiment and do things other people’s ways, the more you actually WILL learn about yourself. You will figure out what types of workouts you enjoy the most. You will figure out what time of day is easiest for you to workout at and stay committed to. You will figure out if low carb/high carb/vegetarian/WHATEVER is right for you. You will figure out if you stay more committed to a program if you can easily prep all meals for the week ahead of time or if it is easiest for you to cook single portions the day of. Through doing things other people’s ways, you will figure out what works best for you. Just remember though, it is up to you to put your spin on a program to make it completely personalized for you…No one else can do it for you! 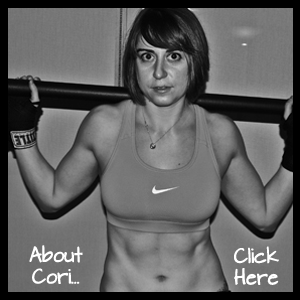 So if you want the perfect healthy lifestyle for you – Learn, Do, Decide, and SPIN! Workout Toys For Kids…Are they a good thing? Childhood obesity is an issue. Kids love to act like their parents and do what their parents do. My question then is, can you use the second fact to solve the first one? WOD Toys thinks you can! They’ve created a new line of fitness toys so that children can “work out” like their parents! I wish my face looked that cute when I snarl! Is this workout equipment for kids a good thing? I think so, but at the same time I’m not sure it is really a solution to our childhood obesity epidemic. The equipment (and the little girl using it) are pretty darn cute! Plus, I can imagine lots of kids loving to lift like their parents do. For years, companies have made toys that allow kids to mimic their parents. Now children have a toy that will help make them more active! And the thing is, they won’t think of “working out with their parent” as a chore…to them it will be playing! And if kids start associating “lifting” with “playing” at a young age, maybe they won’t dread working out as much as they get older? Some question I have are…How often do most parents workout in front of their kids? 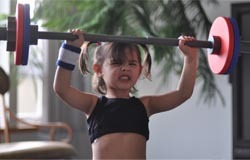 Most people here don’t have their kids watching them workout…Are Crossfitters bringing their kids to their workouts? I mean I used to watch my mom do her workout tapes at home, but how often are parents using a barbell for Olympic lifts at home? How often are most parents even working out at home? AND are the kids with parents that DO WORKOUT, the ones that are really a part of the obesity epidemic? So while this equipment may be encouraging kids to be active…Is it encouraging the kids who need it the most? Is it really a solution to the obesity epidemic? What do you think? Would you buy this for your kids?